Deciding on the perfect fifth wheel to suit your travel needs can be tough. With so many options on the market, it can get overwhelming. Of course you want a fifth wheel that’s durable and will provide you and your family the highest in safety standards, and you also want the luxury features that make traveling in an RV feel like home. 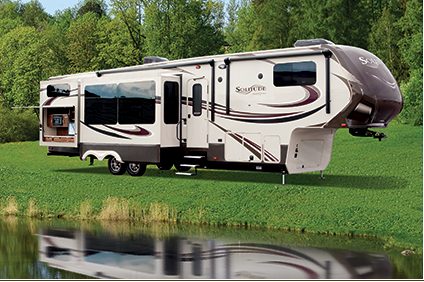 With Grand Design Reflection Fifth Wheel and Grand Design Solitude Fifth Wheel, you can have both! With an active community of owners, Grand Design RV is the perfect choice for RVers who are looking for the support and resources to make the most out of their travels. With rallies and forums, Grand Design RV has opened the door to owners making it easier to stay up-to-date on the newest safety features and accessories available to your. Narrowing your fifth wheel choice down to Grand Design RV is easy — deciding between the Reflection or Solitude may be a little trickier. While both the Solitude and Reflection will offer you the reliability and durability Grand Design RV is known for, each offer a different element to your choice. 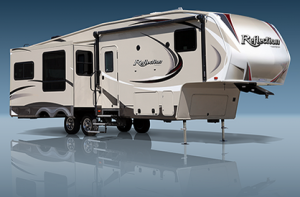 Both the Reflection and Solitude are stunning fifth wheels inside and out, but if you’re looking for a roomier fifth wheel, the Solitude is for you. With taller ceilings, deeper cabinetry, and a larger slide-out, this is the fifth wheel that will provide you a spacious ride. If it’s luxury you want, check out the Reflection and it’s high-end features. While still spacious, the fully-loaded Reflection will give you the ultimate in luxury RV travel, deserving of a higher ticket price. But priced lower than the Grand Design Solitude Fifth Wheel, the Grand Design RV Reflection Fifth Wheel is perfect for those wanting the best in design at a price that won’t break the bank. Ready to see for yourself the amazing features Grand Design has built into their fifth wheels? Visit us today to find your perfect fit in either the Grand Design Reflection or the Grand Design Solitude. Our helpful staff will show you around and answer your questions.